Chocolate bloom added some artistic shading to this Le Petit Ecolier cookie! Whether you need a way to keep kids entertained during the holidays, or a way to use up all those extra candy canes, here are some some of my best Christmas classics from candyexperiments.com. Favorite experimental chocolates from the Northwest Chocolate Festival--maybe you'll get some Christmas ideas. Pop Rocks create the explosions in these "Exploding Chocolate Frogs." If you can't make it to Chocolate Affairs to buy some, online recipes teach you to make your own by stirring Pop Rocks into melted chocolate or molding candy, and pouring it into a frog mold. Here's a treat for somebody who needs an extra reason to eat their vegetables. Amore Earth is experimenting with vegetable-filled chocolate truffles. Of those I tasted, the broccoli truffle was OK, but I wouldn't recommend the beet (you'd think beet would be good, considering beets can be used in sugar production). Personally, I think I'll enjoy my vegetables and my chocolate separately, but I applaud the experiment. Carter's Chocolates, the creators of this chocolate, truffle professed no political preferences. Some people apparently bought these to honor President Obama, and some people delighted in biting his head off. While I don't see these currently listed on the website, you could also try new ideas like chocolate-dipped bacon. Cacao Yogi infuses their chocolate with gold to aid in meditation. Although the purpose was carefully explained to me, I don't know that I can do it justice, so I've included their own explanation. And finally, a chocolate dipping machine, handmade by the Chocolate Dude, that tempers the chocolate and heats it as you dip treats to your heart's content. It only costs $525! It's holiday time, and therefore cookie time. But what happens when you put the wrong candy in the cookie? As the Skittles baked, they got chewier and harder, probably because so much of the water from the soft fillings evaporated. The ones on the bottom melted into chewy puddles on the pan. I don't know if I'd recommend them as a cookie filler, but they were sure fun to play with! 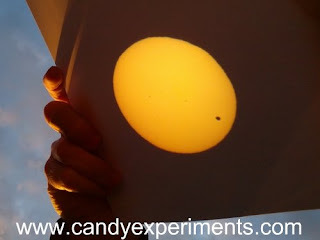 And does anybody remember the transit of Venus last May, when the planet Venus crossed in front of the sun, forming a tiny black dot? Here's my "Transit of Venus" cookie. My 7-year-old son created this for my demonstration when I was on TV a few weeks ago, using old Warheads and new Halloween candy. After a few weeks, we noticed that the Warheads were dripping. They'd absorbed so much water from the atmosphere, both before and after they were opened, that the surface started to liquify, dripping into candy puddles on the plate. My daughter brought home an article in Time for Kids about 13-year-old Mallory Kievman, who says she's invented a cure for the hiccups. After testing all sorts of various hiccup cures, and deciding that the most effective were apple cider vinegar, sugar, and lollipops, she combined them into a hiccup-curing lollipop. Now she's working to turn Hiccupops into a retail brand. You can find more information and news articles at her website, hiccupop.com. 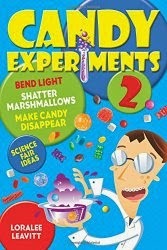 What can your family invent with candy experiments? I'm calling these candy experiments because if you work on pumpkins long enough, you can turn them into dessert. Actually, I just thought they were cool. I had never before noticed the "ribs" attached to the side of the pumpkin shell, or how the sliced-off strands in the pumpkin top form such a beautiful sunburst. There's so much beauty in the world around us! I hope you find your own small miracles to enjoy today. Happy Thanksgiving! This was our very first post-Halloween candy experiment: squashing Junior Mints to make candy mushrooms. I'll have to squash other candies to compare. In case this isn't very impressive, I did do some very cool post-Halloween experiments that I'm trying to get online. But first, I have to work on some videos (a little harder after my husband reconfigured my computer and all the programs moved around.) Check back soon! A post by the Candy Professor pointed me to an article about chocolate cravings in the brain. When a certain area of rats' brains was stimulated by enkephalin, the rats ate more M&M's. Yet another clue as to why we seek out sweets. Candy Experiments on Steve Spangler blog! 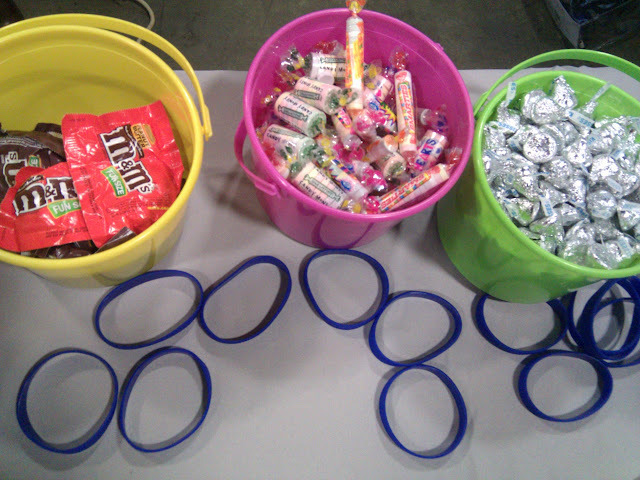 Check out my guest post on the Steve Spangler blog for some of my ideas on using up Halloween candy. Along with favorite experiments from this website, I include tips on encouraging your children to create their own experiments, as well as tips on cleaning up! I connected with Epoch Times when they posted a picture of my son from the USA Science and Engineering Festival. 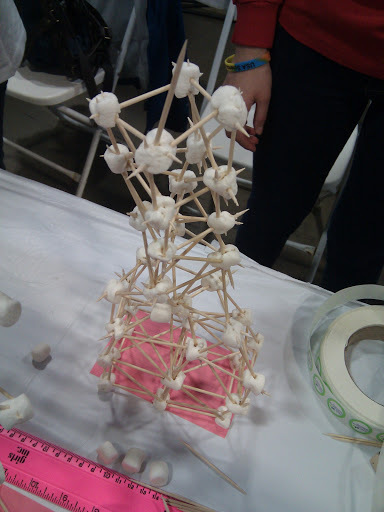 When I contacted them to request a copy (we hadn't taken many photos at USASEF because we were way to busy), they expressed interest in candy experiments and asked to do an interview. You can read the article here. Wishing you joy as you experiment and play with your extra Halloween candy! 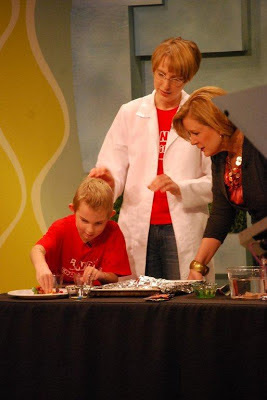 This morning, my son and I demonstrated candy experiments on KING TV's morning show New Day. Watch it here! Check out my Halloween candy article at Mothering.com. I've got instructions for mixing colored potions, bubbling potions (using the acid test), melting candy, and fun candy crafts, like this poster made by my kids and my preschool teacher mother. My experiment cards disappeared from the website for awhile, but now they're back! Find them here. I love the Skittles Density Rainbow, with its brilliant colors. But it can be tricky to pour. I've added an alternative method to the Density Rainbow page. This one uses Nerds, and it seems to work quite well. Check it out beneath the Skittles instructions at Density Rainbow. The Center for Science in the Public Interest, which tries to educate the public about nutrition and the amounts of sugar in various treats, just posted some ideas for Halloween parties that don't focus on candy. There's also a link to a new PopCap Plants vs. Zombies video about brushing your teeth, and you can print coupons for downloading a free PVZ game for trick or treaters. Candy experiments made the list for 10 Experiments for Halloween on The New Home Ec. Check it out--there's also a density rainbow in Halloween colors, glowing experiments, and a Steve Spangler oozing pumkpin. Find instructions for getting the coupons at CandyYumYum.com, or visit the Lindt Facebook page. Buying a bag of cotton candy was a new thing for me. Of course I didn't want my kids to eat all of it, but I thought I'd let them try it to see what the excitement was all about, and I wanted some of my own to experiment with. (Heh, heh!) So to celebrate this unusual occasion, I decided to get an unusual bag. After we tasted our candy, and dropped some in water to dissolve, and squashed some of it, we let the rest sit in the bag. As the weeks passed, the candy slowly collapsed into itself, eventually shrinking to a mass the size of my two fists. And something startling happened: specks of pink and blue color reappeared! I also love the wrinkled shape. It's a candy brain for Halloween. I just shared some Halloween candy literacy tips with Bob Books. Find them here! Candy Corn must be the popular flavor this fall. I just saw a news posting for Candy corn oreos, and CandyYumYum just reviewed candy corn M&Ms. Wonder what they do in water? 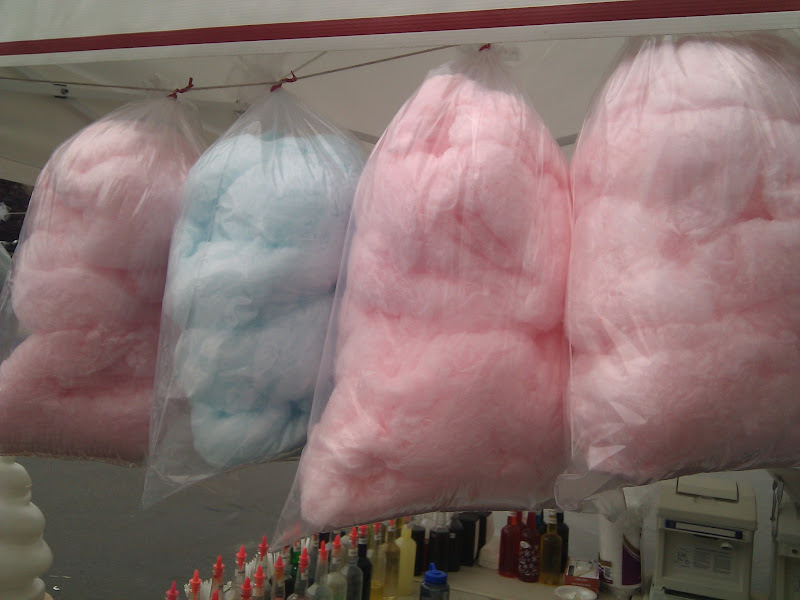 Cotton candy is made almost completely from sugar, with a few extras like dye and flavor. 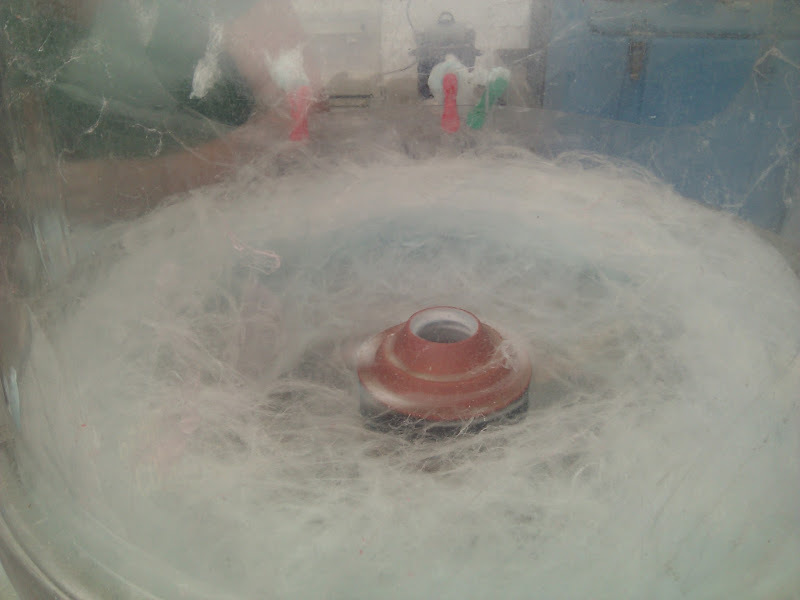 So it shouldn't be a surprise that cotton candy can can form crystals. When cotton candy is made, it's melted into noncrystalline strands of caramelized sugar. But after we smashed it into a ball, washed it and let the water dissolve out some of the sugar, collected the sugar in a puddle, and let the puddle dry, small crystals started to develop in the center. We had to throw the experiment away because my 4-year-old kept trying to lick it. But next time I get some cotton candy, I'll have to dissolve it, and see if I can get any crystals to grow. Here's a great video from the University of Plymouth in which a Jelly Belly meets a fiery end. As school starts up again, it's time to think about nutrition of cereals, snacks, and treats. So I really enjoyed comparing this chocolate cereal with chocolate sandwich cookies. 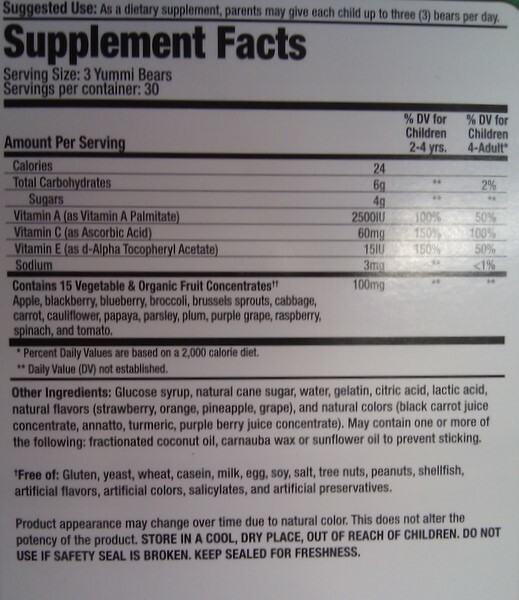 Here's the ingredient list, and the answer to the cookie/cereal quiz. The label on the left, even though it lists filling as the first ingredient, is actually the label for the cereal. The label on the right is for the cookies. Sugar: 30 grams of Krave contain 10 grams of sugar, making it 33% sugar by weight. This is actually a little less than some others, like Cocoa Puffs (37% sugar) or Golden Crisp (52% sugar). But compare it with Dare chocolate cookies: 40 grams of cookie (that's two cookies) contains 12 g of sugar, or 30%. The cookies have less sugar by weight than the cereal! Oil: Both treats also contain oil, which adds calories. The cereal contains about 12% fat, while the cookies contain 25% fat. Calories: 40 grams of Krave contains 160 calories, less than the 200 calories you'll find in 40 grams of cookie. It's hard to which one sounds more like dessert, the cereal or the cookies. Certainly neither of them go in a healthy breakfast. But if you're choosing a sweet treat for your children, keep this in mind: Krave has vitamins added, which may interest you, and a bowl of Krave might take a little longer to eat than two cookies. All the air bubbles in Krave cereal (honestly, the stuff feels about as heavy as Styrofoam) spread out the sugar, giving you less sugar per bite. So if you're choosing a dessert that your children can savor for a longer period of time, the cereal might be a better choice! This news report details how the sodas and sports drinks teens are drinking daily are actually causing them to lose tooth enamel. The same thing would happen to somebody who regularly consumes acidic candy. Too bad I didn't see this in July--it sounds like a great activity for the 4th! A fellow blogger, at her daughter's suggestion, tried putting Pop Rocks onto ice cream to make Fireworks ice cream. Read more about it at smmartideas.blogspot.com. It was a present my husband bought me: a box of Kellogg's cereal Krave. Not for me to eat, he assured our astonished relatives, but for me to marvel at. I pulled out a box of chocolate sandwich cookies to compare them with. Here's the quiz: which ingredient list comes from which box? At a recent art fair, I met a photographer who's getting closeups of things I've only ever seen as powder. One of my favorites was citric acid, which adds sour flavor to many kinds of candy. It is also used in Pixy Stix, which is why the Pixy Stix work so well for the acid test--when you pour the powder into baking soda water, it fizzes like soda. Pixy Stix work especially well because they're made with powder that dissolves quickly, as opposed to a solid candy like a Lemonhead. I left my rounded mass of cotton candy on my dresser for a few days after I bought it. Thanks to gravity, it didn't stay round very long. Instead, it started to flatten against the dresser. When I propped it up against my jewelry box instead, it sank around the edges of the box, retaining the shape of the corner. I wonder how long I'd have to leave it to let it get as flat as a pancake? "I can't believe you're buying that," said my sister as I paid for the football-sized puff of baby-blue cotton candy on a paper stick. But there was a question I'd been pondering for weeks: is cotton candy the world's most sugary dessert? When you're eating cotton candy, how much sugar do you actually eat? 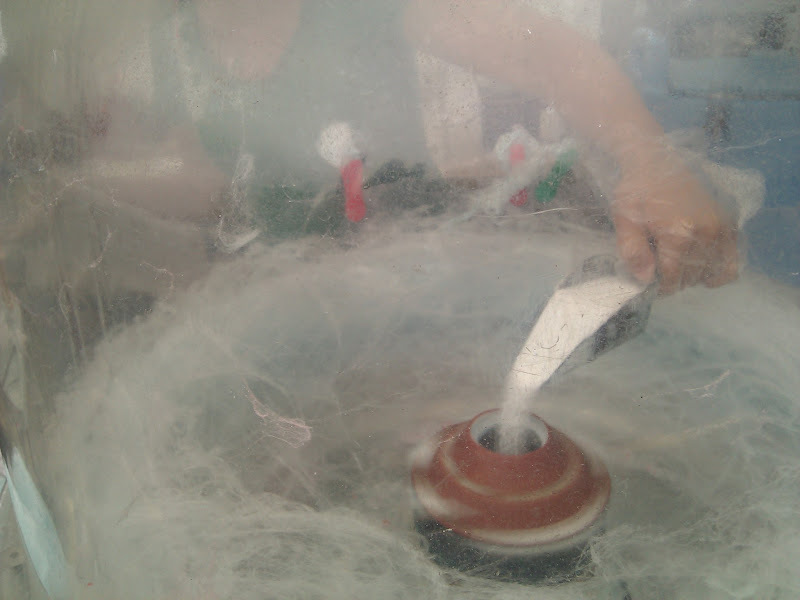 Aside from a minuscule amount of dye, cotton candy is pure sugar, melted and spun into a type of glass. To find out how much sugar I'd eat if I actually ate the stuff, I had to weigh it. I weighed the candy on the paper stick, peeled it off the stick, weighed it again, and weighed the stick to double-check my math. It came out to 42.7 grams of sugar. That sounds like a lot--more than 8 Lifesavers--but on the other hand, it's about the same as a can of regular soda, and only a little more than a serving of fruit juice. So is cotton candy the huge sugary treat it looks like? Not as much as you'd think, since most of what you see is just air). If I had split that day's cotton candy purchase among my three children, it would have been less sugar per child than giving them each a CapriSun. Of course, how much sugar you're eating does depend on how much cotton candy you buy. My next cotton candy purchase, which had several skeins of cotton candy stuffed into a plastic bag, weighed nearly half a pound (we hurried to a nearby grocery store to find out). We only ate handfuls of that one, and experimented with the rest. I never checked the label for Honey Graham Oh's during my Find Hidden Candy searches, but I should have. With 12 grams of sugar per 27 g serving, this cereal is 44% sugar! That's as much sugar as a roll of Smarties and a mint Lifesaver. "Great taste of graham" and "real golden honey?" Even the advertisers aren't trying that hard to make it sound healthy. Note that they don't say "great taste of sugar and high fructose corn syrup," although that's where most of the sweet taste comes from. Parents everywhere pack their children fruit snacks for lunch. They're packaged in little one-serving sizes, they're sweet enough for children to scarf down, and they have the benefits of real fruit. Right? Gummi fruit snacks are hardly different from gummi bears. Though many are made with some fruit juice and include a few vitamins, they have as much sugar as other gummi candies. Samira Kawash of www.candyprofessor.com writes in The Atlantic that "Packages plastered with fruit bouquets and boasting fruit juices and purees give this category an aura of virtue that other candies can only envy. The problem is that the wholesome fruit goodness of fruit snacks is wholly imaginary. Fruit snacks are not fruit. They're not better than candy. They are candy." So when you're packing up children's lunches this summer, pack real fruit. Save fruit snacks for dessert. When we drove up to my in-laws' last week, I hadn't even crossed the lawn before my 6-year-old niece came running up. "Can we do candy experiments?" I hadn't planned on doing experiments, and hadn't brought any special supplies, so I was forced to improvise with what I had on hand: a box of Wintergreen Altoids from my last car trip. I squashed eight kids into a dark bathroom, handed out Altoids to those who dared to eat strong mints, turned off the lights, let them chew, and watched for sparks. Since the littlest kids didn't want to try the mints, and couldn't see the mouths of the big kids, I had to repeat the experiment for them by bagging the Altoids in a Ziploc and squashing them with pliers. Note to self: next time, line the children up in pairs so they know what mouths to look for before I dowse the lights. Just goes to show, you can turn almost any candy into a great experiment. 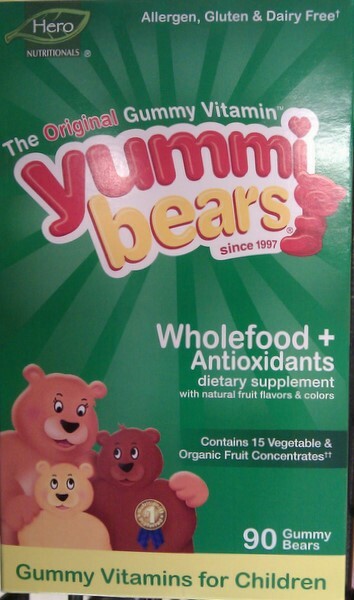 How healthy are these gummi vitamins? Since the first ingredient is glucose syrup (a kind of corn syrup), and the second ingredient is natural cane sugar (plain sugar), these gummi vitamins contain surprises that parents might not expect! If you'd like to give your children candy fortified with vitamins, this is the vitamin for you. 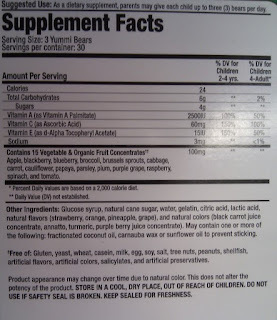 If you'd like to avoid giving your children extra sugar, make sure to check labels! This challenge, from the Human Factors and Ergonomics Society (HFES), was to unwrap a piece of candy using only one hand. How would you unwrap these? 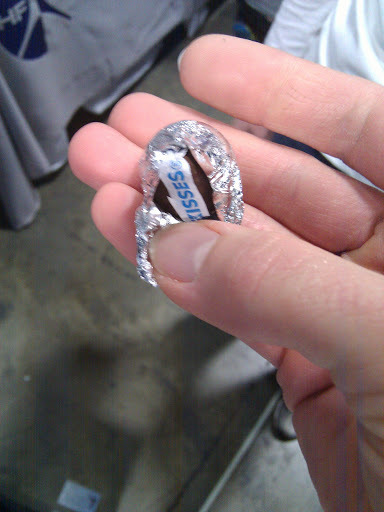 I unwrapped the Hershey kiss, and found it easier to open one-handed than to photograph! (hence the blurriness). Apparently the M&M's were the hardest. I asked the girl what the trick was, but she just smiled and said she'd seen people try several different methods. 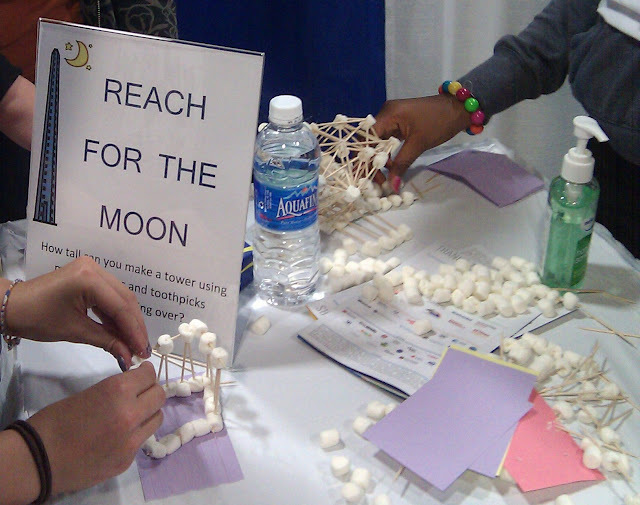 At this booth, put on by Operation Smart of girls inc., people were challenged to see how tall of a tower they could construct with marshmallows and toothpicks. They hoped people would start experimenting with different designs and see which were stronger. For anyone who wants to try this with their kids, here's an online lesson plan from www.sciencedays.org that gives a little more information. For me, the most important thing in this picture was the water bottle. I could certainly relate--hours and hours of teaching experiments is hard on the voice!